The Givenchy-Fountain is one of Satu Bumi’s range of GRC Water Features. 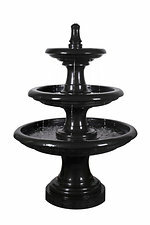 The Givenchy Fountain is quite a large traditional looking water feature and is optionally available with one, two or three tiers. The Givenchy Fountain is available in a number of different old metallic and old stone colours that provide a traditional and appealing aged appearance.